Otzma Yehudit CEO Michael Ben-Ari speaks with Arutz Sheva about his relationship with a young Iranian, tells the story behind the protests. Otzma Yehudit CEO Dr. Michael Ben-Ari for several years has been in contact with a pro-Israel Iranian youth, who is currently updating him on the events behind the recent wave of protests in Iran. In an interview with Arutz Sheva, Ben-Ari spoke about the special relationship between himself and the Iranian youth, and their conversation in Fārsi and Hebrew. "It's a very special relationship, and we've been in contact for a year and a half," Ben-Ari said. "This is a young man who lives in one of the more moderate Iranian cities. He's an academic who has been writing to me in Hebrew and in Fārsi, which I understand a bit of." "This young man taught himself Hebrew via Channel 33, and last year he wrote to me that he's 'in love with the People of Israel,' after reading a book about the Holocaust. He saw one of Ephraim Kishon's videos, and learned about Judaism. He also keeps the Seven Noahide Laws, admires Jews, and asked me if he is permitted to learn Torah." The relationship began after the young Iranian watched some of Ben-Ari's YouTube videos about the world's nations during Biblical times, and contacted Ben-Ari to ask how he could listen to the classes in Fārsi. "When my parents died, he sent me condolences in Fārsi and even expressed interest and dissatisfaction with the Amona expulsion. He promised that if I ever visit Iran as a tourist, he would be glad to show me where my parents grew up." Ben-Ari also explained why those analyzing the protests in Iran have no real understanding of what's happening. "In the past hundred years, Iran has been through two major upheavals," he explained. "One hundred years ago, Reza Shah Pahlavi came into power, founding the Pahlavi dynasty. His son, Mohammad Reza Pahlavi, was overthrown, and his grandson, Reza Pahlavi, is the one they want to return to Iran today." "The founder of that dynasty took Iran in a more Western direction. He chased down the ayatollahs - who by the way, persecuted the Jews a lot. He protected the Jews and he turned Iran into a Western country. He forced the men to walk with hats, and forbade women to wear face masks. He forced them to Western. But in the periphery, large gaps were created, where the ayatollahs' strength was renewed. "In our correspondence, he told me how the ayatollahs succeeded in creating a revolution via lies and economical provocations, until they overthrew the Shah. "He also told me that the Iranian nation in its essence hates the Muslims and the Palestinians. He told me that they are not Muslims, they hate Muslims, and even more than that they hate the Palestinians. The fact that Iran officially supports Hezbollah or Hamas is extremely bothersome to them. "They are proud of their Iranian culture, an ancient culture from the Sasanian Empire, and they don't feel that they are Arabs or Muslims. He sent me videos of their entertainment in cafes, and they are very connected to the West, and expect the West to support them." Speaking about the Revolutionary Guard's claim of having subdued the protests in three provinces and arrested many people, Ben-Ari said, "He told me that this is not true everywhere, they only managed to subdue the protests in areas where there is no internet." "He also told me that even if they subdued some of the protests, the process of overthrowing the government has begun. In great detail, he explained where the protests were yesterday, and told me that in another city, rebels killed three intelligence officers. They are counting the years since Iran was founded, 2576 years, and they want Iran united and free. According to him, they are very strong, and they have weapons. The wave of revolution will not stop, and they are very happy to hear US President Donald Trump's tweets." Ben-Ari expects that Iran will end up a democratic country. "The movement that is shaking things up is moving towards balance between the Shah's secularism and the Islamic revolution which stopped the Westernization and denied ancient Persian culture," he explained. "This is a country with a very developed culture, with music, art, and songs. You hear them longing for the days of the Shah, and they shout, 'Long live Reza the Shah.' He is the grandson of his dynasty's founder, and they're waiting for him, they want a democratic government." "What is happening over there is very significant, and it has reached the point of no return. Even if here and there the government manages to subdue the unrest, the hatred of the Iranian government is so strong that they will not manage to survive. He wrote to me that the people scream at the Revolutionary Guard's police officers, 'Give in! Return the Shah! Long live the Shah!' They are like the British, proud of their dynasty even though they understand that they don't want to return to the same absolute rule and are more interested in the ceremonial side of it." In his tweets, Ben-Ari's correspondent wrote, "I want to tell you a story about what was before the protests started. Three days before the beginning of the rebellion. Unfortunately. In the middle of the night, some Islamists and Basij burst into a synagogue in Shiraz, tore the Torah scrolls and prayer books, it was a huge tragedy. I am a gentile, not a Jew, but I know that the Torah is the holy of holies and I was very sad, but I told my friends, 'Evil like this has a heavy price,' and three days later the rebellion started." In another tweet, he sent a video of himself and another young man at a cafe, smoking hookah. "Tonight at midnight in a cafe, a guy with jeans is smoking hookah. This is me and the other guy is a friend, but our faces are not in the picture," he wrote. When Ben-Ari responded, "Enjoy!" the Iranian wrote back, "Thanks, but under this rule there's no enjoyment at all in life." 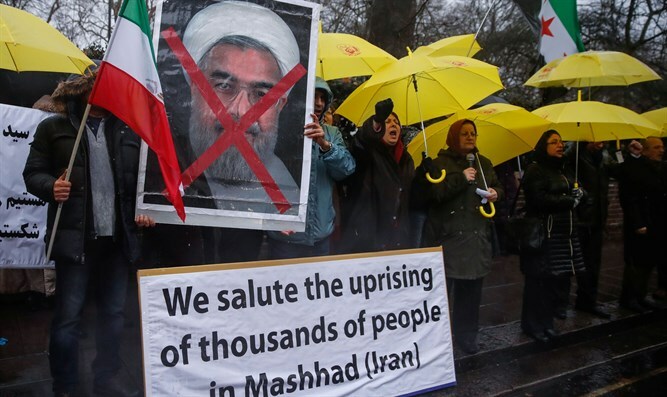 The Iranian uprising, the largest since a series of mass protests in 2009, began in the city of Mashhad, when demonstrators denounced Iranian President Rouhani over the failure to reduce the country’s high unemployment rates. Efforts to contain the protests have led to the deaths of at least 21 people.